“The invitation from Harvard University caught Oprah Winfrey at a low point. Her new TV network was struggling, branded a flop in the media, when Harvard President Drew Gilpin Faust called last year to ask Winfrey to address 2013 graduates. The request came ‘in the very moment when I had stopped succeeding,’ Winfrey recalled. She headed for a long shower to think (‘It was either that or a bag of Oreos,’ she joked) and emerged resolved to change her story by the time her speech rolled around. A year later, Winfrey said, her Oprah Winfrey Network has found its footing and her approach to facing setbacks had been validated. Stumbles are inevitable but not permanent, Winfrey told graduates Thursday [May 30]. Read more from Wonderwall on MSN. to be inclusive of all here, rather than so divisive and exclusive! “Japan has suspended certain wheat imports from the United States after a genetically-modified crop was found growing in an Oregon field. Japan, the second-biggest importer of U.S. wheat behind Mexico, canceled some orders while the U.S. tries to figure how the illegal Monsanto wheat got to the Eastern Oregon farm. Other top Asian importers, like South Korea, China and the Philippines are closely monitoring the situation. Many countries won’t accept imports of genetically-modified foods. The European Union announced it’s preparing to test incoming wheat shipments after the discovery. Roughly 90 percent of Oregon wheat is shipped overseas, generating a half-billion dollars in revenue every year, said Oregon Dept. of Agriculture Director Katy Coba,,” quoting KGW in Portland. 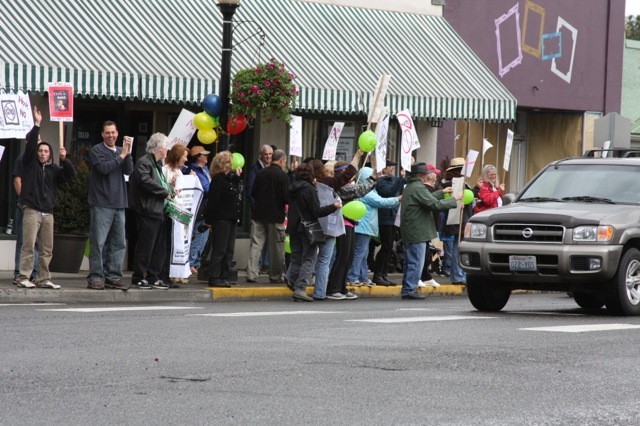 Our neighbors need help – Yelm in national news – AGAIN! “A Yelm man is under arrest after Fife police said he left his two daughters, ages 4 and 5, alone in a parked semi-truck while he gambled at the Emerald Queen Casino for more than five hours. “Fife police responded, and as officers investigated, the girls father, 34-year-old Terry Jonason, came running from the Emerald Queen Casino directly across the street. Posted by Steve at 7:05 pm | Permalink | Comments Off on Our neighbors need help – Yelm in national news – AGAIN! The Triad Theater is proud to present the Phoenix Rising School’s student production entitled Grease Lightning! Students in 3rd 6th grade classes will be highlighting songs and dances from the “fantabulous” high life in the 1950s in this abridged performance of the musical GREASE. The middle school students are the ones that have made it happen, says Sophie Sykes, theatrical director. They came up and asked me if they could do it. Proceeds go directly to help further the school’s Arts program. $10 per person, children $5. Strongly suggested to purchase tickets in advance as this event is sure to sell out! Is Harding weighing down Alexander’s Auditor run? Thurston County Auditor Gary Alexander may have more baggage in running for Auditor than stating his intentions whether he will resign or not seek re-election to his legislative seat if he wins the auditors job. Last January, the day before Thurston County Commissioners were to chose a replacement for Kim Wyman after her election as secretary of state, Yelm Mayor Ron Harding dropped out of consideration for Auditor, the next day Gary Alexander was chosen, then Alexander chose Harding as Deputy Auditor. Two-term Mayor Ron Harding, who filed for a 3rd term and is considered elected in running unopposed, earns a $30,000 a year part-time salary, added to his current full-time Thurston County Deputy Auditor day job, a $70.000 a year position plus benefits. With a combined salary and benefits package, Harding’s annual take at the public trough is valued at approx. $125,000+. Harding holding onto these two posts may be more problematic for Rep. Alexander in his election bid than his own two public jobs. Posted by Steve at 6:32 am | Permalink | Comments Off on Is Harding weighing down Alexander’s Auditor run? “Bail was set at $1 million Tuesday [May 28] for a 25-year-old Washington man accused of putting his 6-week-old daughter in a 10-degree freezer for about an hour to stop her crying. Doctors believe the baby will survive but it’s too soon to know potential complications, Pierce County Prosecutor Mark Lindquist said. The child’s core temperature fell to 84 degrees in the freezer, prosecutors said. She also had a broken arm and leg and a head injury, medical staff determined. Read more from KING-5 in Seattle. As I read the Nisqually Valley News [NVN] on Friday, May 17, I noted the bottom of page A-3 that Mayor Ron Harding is taking time-off from his full-time Thurston County Deputy Auditor “day job” to drive back to Yelm to speak to local groups about the Yelm Park Plan, a plan costing approximately $5.7 million. The public was omitted in any discussion of this plan being added to the ballot, yet Harding is courting local groups for support? I am very concerned that Mayor Ron Harding omits the public-at-large from full-disclosure of the whole story about the Yelm City Park Levy, now on the August 6, 2013 ballot, as I read in the newspaper he is speaking to the Yelm Rotary Club, the Yelm Lions Club, and the Yelm Real Estate Association with his spin. This IS Harding’s modus-operandi – instead of a Public Forum, he gives speeches to controlled groups, with most members not even living in Yelm nor eligible to vote on a City of Yelm Levy and whose group members rarely pose challenging questions. This way, the mayor can say he communicated on the Park Levy, yet without his ACTUAL voters engaged in public discourse, behavior his City Council condones! I would hope that the Rotary Club and other groups would be interested in providing the “alternate view” of Mayor Harding’s spin on the Yelm Park Levy, commonly done after all Presidential speeches, as example, to provide balance rather than a one-sided view from the top official. There is a sense of unease on how the cuts will affect Yelmites. Residents are hurting here and will vote to pay an AVERAGE additional $110 per year for 25 years on top of annual water rate increases, annual sewer rate increases, regular B & O tax increases & ad valorem tax increases. With over 30% of our population comprising military families and Sequestration cuts to trickle-down here by Fall, this tax puts a tremendous burden on Yelm residents. Even the NVN online poll published on this was over 3-1 against. Everyone wants park improvements, however when taxpayers understand this hits them in the wallet, they say a resounding NO! Let me be clear: I AM IN FAVOR OF A PARK OVERHAUL! However, I am in favor of public involvement at the grass roots level on this issue and for any tax levy. That was lacking in this Park Plan. – Reintroduce the Park Plan concept with public interaction from the start (i. e. Town Hall Forums). – Public participation on the Park Plan’s ad hoc committee, rather than just city officials. I AM FOR FULL PUBLIC DISCLOSURE AND PUBLIC INVOLVEMENT IN EVERY ASPECT OF THE PROCESS, WHEN TAXES ARE TO BE BORNE BY THE LOCAL RESIDENTS, SOMETHING THIS CITY COUNCIL HAS YET TO LEARN AFTER THEIR DISASTROUS 2005 WAL-MART DEBACLE, RESULTING IN THEIR BEING BEING THE RECIPIENT OF THE EGREGIOUS 2006 JEFFERSON MUZZLE AWARD! 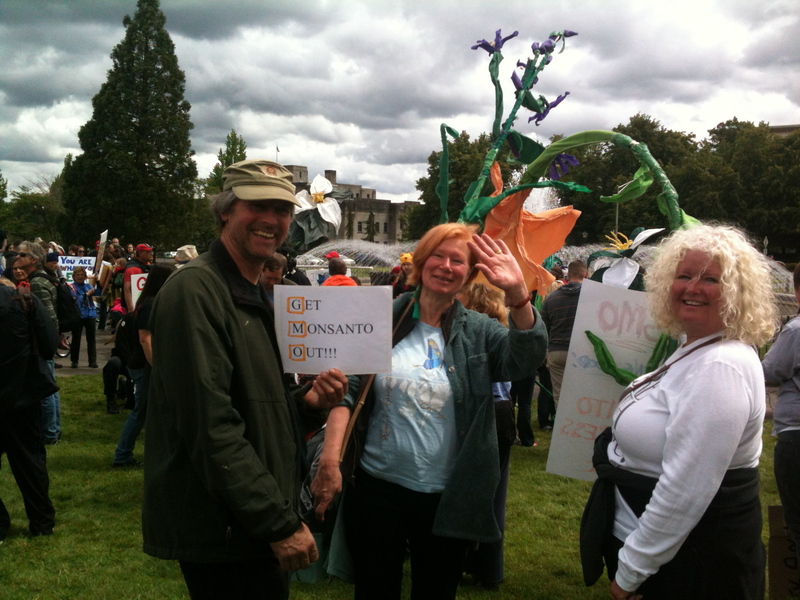 “Organisers say that two million people marched in protest against seed giant Monsanto in more than 50 other countries on Saturday [May 24, 2013]. 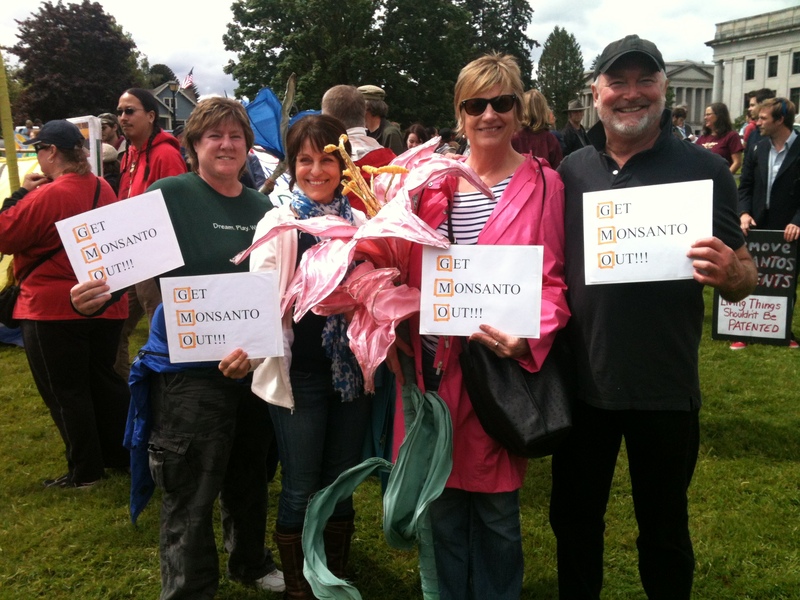 “March Against Monsanto” protesters say they wanted to call attention to the dangers posed by genetically modified food and the food giants that produce it. Founder and organiser Tami Canal said protests were held in 436 cities across 52 countries, quoting the AP in UK’s Guardian. Yelm’s Triad Theater hosted the local gathering. Click here, by Andrew Wright & Lisa Fitkin of New Leaf Media Group. Click here for their Photo Album. From Anthony Gucciardi for Natural Society. Blog writer Klein is in his 28th year as a student of Ramtha’s, has been employed by JZ Knight for 10 years and a resident of Yelm for 25 years. Thank you, JZ Knight, for your generous donations to SE Thurston Fire Authority over the years. the Fire & Rescue newsletter, fire prevention and safety education flyers, community outreach, and events. The fire authority has not had the budget to provide the previously mentioned services in the past, especially during these rough fiscal times. The generosity of JZ Knight is very much appreciated and the next time you see JZ Knight, please thank her. Without her generosity, there would be no community outreach program for S.E. Thurston Fire Authority. Read more in The Olympian.